I went straight to my trainer to learn all the recipes. I crafted the new glyphs – but not the Monk glyphs. Is anyone buying Monk glyphs? Demand for glyphs rose and good sales were made. But as i suspected the demandwas not abnormally high – certainly not another glyphmas. I was still making good sales at 10pm at night. On my server i was selling the new glyphs at 600g as fast as i could put them up until competitors came on and started posting at 100g. They are now trading down at 30g to 75g and falling. TradeskillMaster worked a charm – so hats off to Sapu the author. Indeed, all my addons worked with the exception of Gearscore which i disabled. in all, a good day at the Auction House. Worth noting that Blackfallow Inks can still be converted at the ink trader for now – maybe it will be fixed in the near future. But in any event it still means that Cataclysm herbs can be used for Inscription and i am buying the cheap herbs that the panic’d sellers put on the Auction House and converting them as i go. 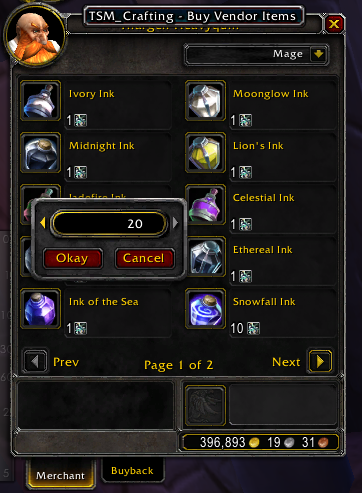 as can be seen above, i am buying 20 Ink of the Sea using Blackfallow Ink. I think what you're seeing here is the prevailence of an increasingly aware player base latching onto 'sure' markets. Glyphmas 1 is common news to any regular blog reader and as time went on and people began to boast publically more and more about 'amazing' profits derived from this market, it simply encouraged more people to try it out. Ironically, the gold makers then starting boasting about tactics they use to combat these entrants and protect markets. Suddenly, the protected markets of the gold makers became far less exclusive and for those players whom 20g profit per glyph is an acceptable standard, the days of shoring up easy profits in inscription are starting to wind down. More to the point though, it's showing practically that making serious gold in the game is in itself a 'gated' process, either by the methods used OR by INFORMATION on how to do it. There really are no real barriers (gates) to entry on most gold making ventures in wow besides time. Rarely luck will play a part, it'll continually come down to information and protecting your market share. Ironically, gold blogs are becoming their own worst enemy in protecting patches for profit! 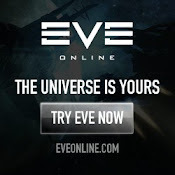 My second blog looking at my experiences and observations in making Isk in Eve Online. My first attempt at making ISK got me to 420bn and ended in Febraury 2017. My second attempt started in March 2019. My first blog was of my experience and observations of making over 1 million gold in World of Warcraft. What do Auctioneers bring to the game? Weekend Post: A new glyphmas – perhaps not? Wealthy on WoW - A blog of gold making! Why Rossi is Wrong about Warriors.